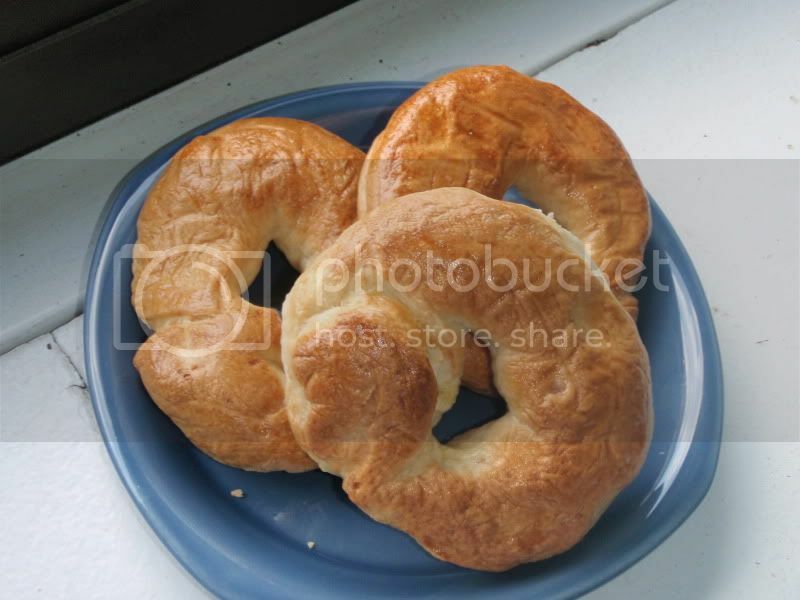 TheFishie's Kitchen and Home: Bagels from scratch! 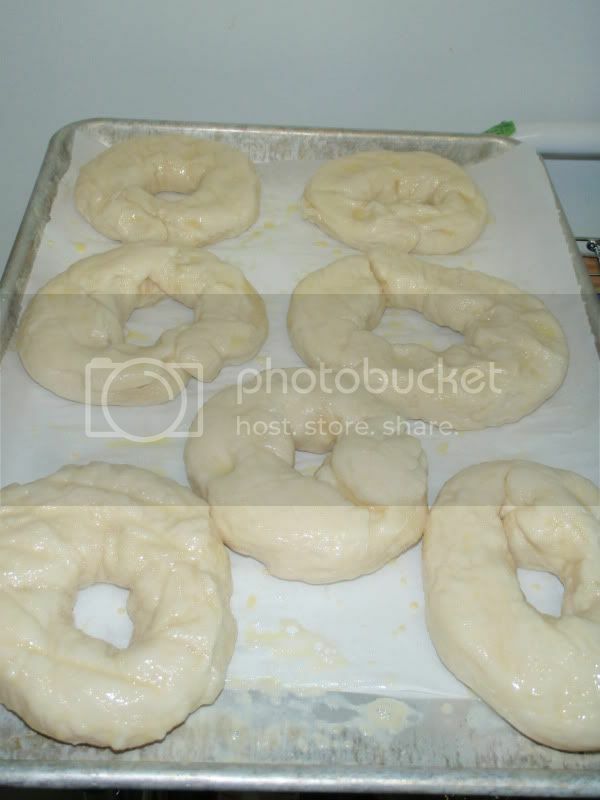 This morning, I was carb-craving, so I made bagels from scratch using this recipe posted on one of my housewife blogs, Frugal Antics of a Harried Homemaker. She credits Joy of Cooking. 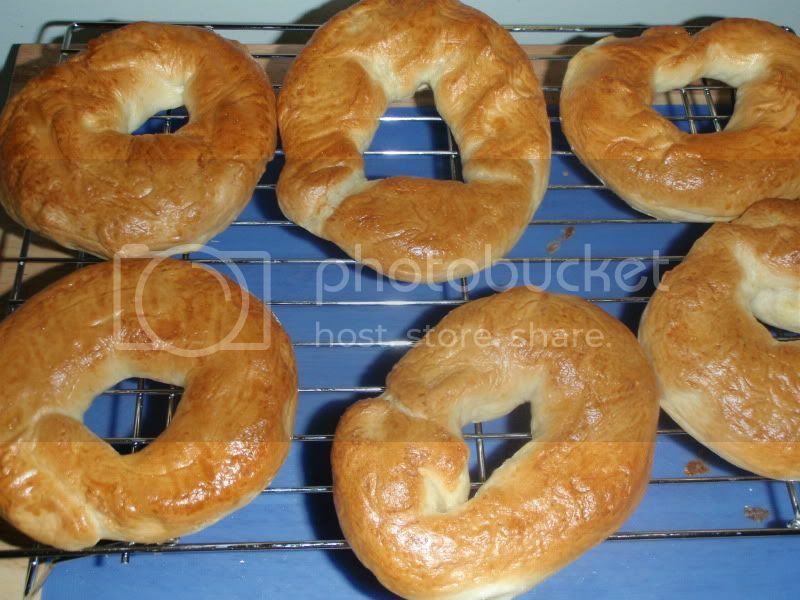 I didn't make any major modications, but here's the recipe with my step-by-step pictures. 1 egg beaten with 1 T water. Combine the water, yeast, sugar, oil and salt in the mixer. Let rest for 5 minutes until a "sponge" had formed. Add the flour, 1/2 a cup at a time. Mix until smooth and elastic using your stand mixer. I swapped the all-purpose blade after 2.5 cups of flour were in and used the dough hook and my hands. Let it sit in the bowl, covered for 15 minutes--it will not be doubled in size, but will be larger and slightly poofy. Divide into 8-10 pieces and roll into 10" lengths. I didn't measure and think I exceeded that length. 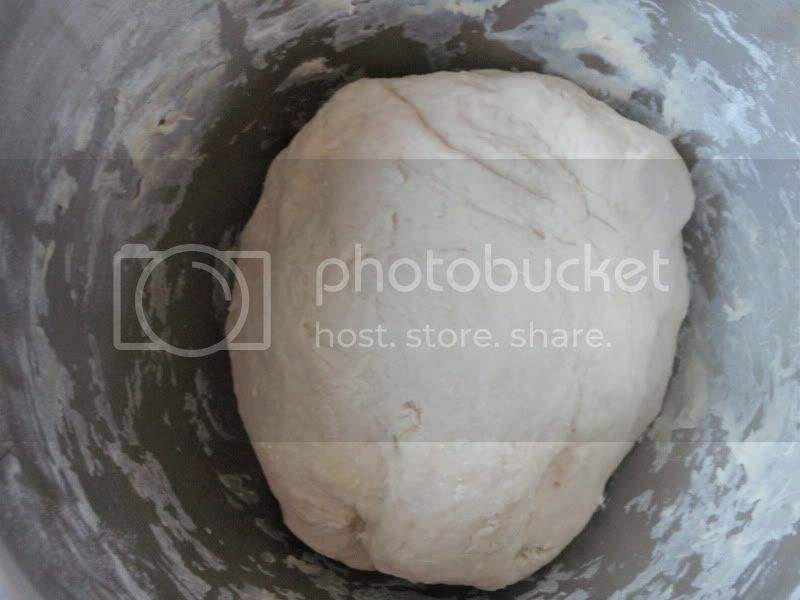 Make sure that the dough is even the entire length. Form into rings and wet the ends to seal. Place on a floured baking sheet, cover and let rise for 20 minutes. Boil a large pot of water, add 1 Tbls sugar, and 1 tsp salt once the water begins to boil. 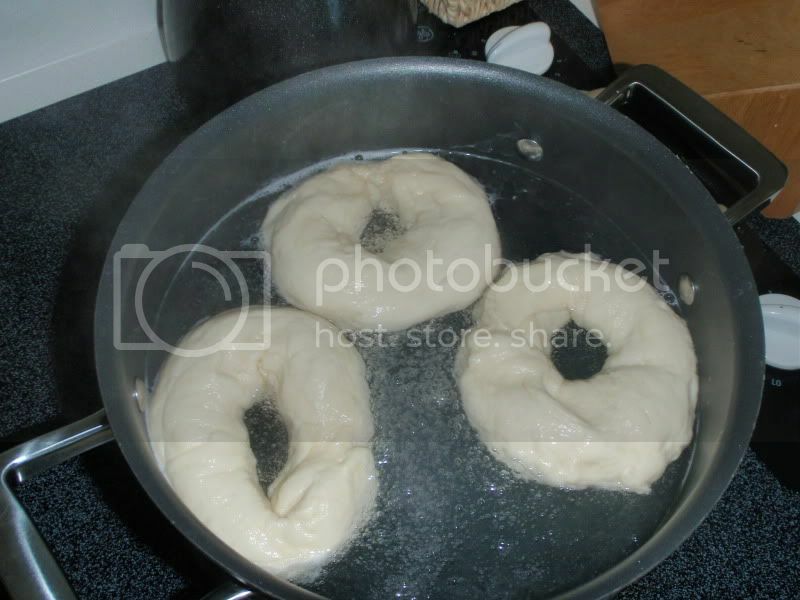 Carefully cook the bagels about 3 minutes each. I believe this step is so the bagels hold their shape. Be sure not to crowd the pot. 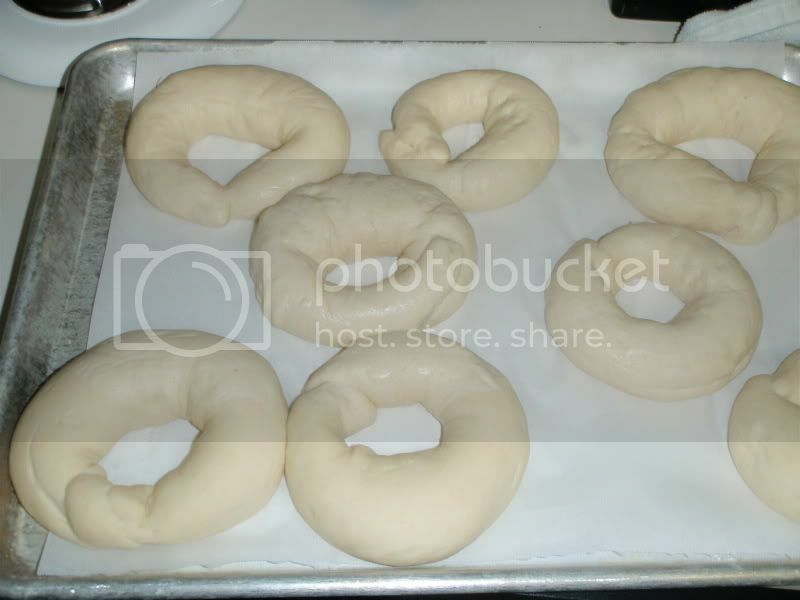 (If you didn't seal the bagels properly on the previous step, they will fall apart here and you'll have crescents instead of bagels. Return to baking sheet and brush with egg mixture. Bake 20 minutes at 425 degrees until golden brown. The final result wasn't too bad. Some were a little thin and therefore crisper that I'd like, but not bad for a first try.